Tell us about your career prior to UW MBA program. I worked with Quicken Loans out of college as a mortgage banker for a couple years, eventually becoming licensed in 11 states. I then went to the Poconos where I helped open a waterpark resort at Camelback. My responsibilities included revenue and labor reporting, setting accounts payable procedures, and general hotel management duties. What motivated you to pursue an MBA in Real Estate at Wisconsin? When at Camelback, I joined the team as development was wrapping up. I found the entire process fascinating and desired to change my career to a more development focus. After researching potential schools to attend, Wisconsin jumped out with its excellent academic reputation and affordability. What topic(s) within real estate interests you the most? Have you been involved in any application-based learning such as case competitions, appraisal projects, or REIT trading? Where geographically are you most interested in working after graduating from the program? How has your WREAA membership been beneficial to you? 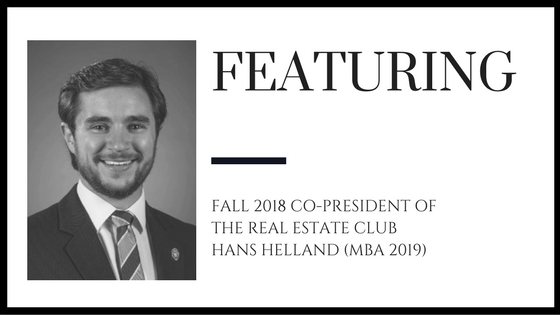 The strong alumni connection with the real estate program, as enhanced by WREAA, has been one of the most beneficial parts of my time here at Madison, and was one of the deciding factors in choosing to come to Wisconsin for my MBA. Having an opportunity to speak with industry leaders because of my WREAA membership is something that not many schools can offer. How long have you been a REC member? Since September 2017 when I came to school here. What have been your favorite experiences with WREAA or the Club? The spring 2018 REC trip was fantastic with the quality of the companies we met with and the events set up for students to meet alumni living in and around Boston. WREAA’s support of the semi-annual trips, in my opinion, is essential to the success of the club overall. The speakers that have been brought in for club meetings have been very enlightening and have helped broaden my understanding of the real estate industry. What hobbies keep you busy outside of school? Playing basketball and ultimate Frisbee, hiking and kayaking, and traveling.